The official weigh-ins for “UFC Fight Night 98: Dos Anjos vs. Ferguson” took place Friday at the JW Marriott Hotel Mexico City. The UFC once again conducted an early weigh-ins for this event, so all of the fighters’ official weights have already been registered. The ceremonial weigh-ins will be held at 6PM ET/3PM PT inside Mexico City Arena, site of tomorrow’s event. A critical lightweight shootout between former champion Rafael Dos Anjos and Tony Ferguson headline Saturday’s featured contest. Both fighters hit their required marks on the scale. It was a completely different, yet similar, story for Charles Oliveira (pictured), however. The Brazilian came in a whopping nine pounds heavy for his featherweight tilt with Ricardo Lamas. Oliveira accepted the bout at the last-minute, but it doesn’t change the fact this was the fifth time he has come in heavy in his UFC career. 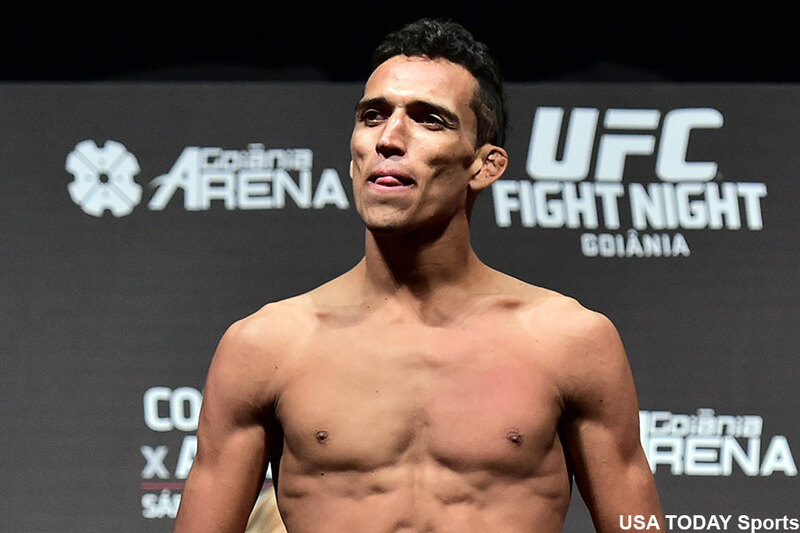 Despite Oliveira’s massive weight advantage, the fight will go on as scheduled as long as Oliveira doesn’t gain more than 10 pounds before fight time. Oliveira was docked 30 percent of his purse. FOX broadcasts the main card live starting at 10PM ET/7PM PT. * – Arantes fined 20 percent of his purse for missing weight.